Fleck 2850 Filter, 21″ X 62″. Will support a service flow of up to 50 gallons per minute. For want of better name, we call the filters made with the second size top hole 4″ filters. The filter above is from this group. In general terms, filters of this size are for use in situations needing flow rates above 10 gallons per minute. Here is a chart that gives some typical uses with maximum effective service flow rates, in gallons per minute (GPM). 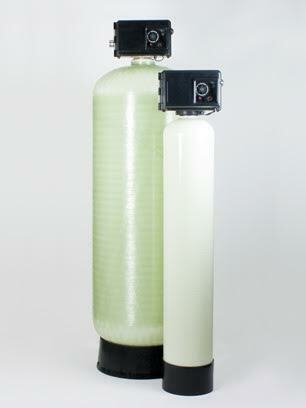 Zeolite (Turbidex) filter removing sediment from well water. Prices of filters given below include control valve (mechanical timer), Structural Mineral Tank, Drain Line Flow Control, Riser with upper and lower baskets, media funnel, and gravel underbed. We pay shipping to lower-48 addresses. Usual lead time is about 4 days. Prices above are for the filter only. Gravel underbed is included, but not filter media. Filters may be ordered with or without media. If media is purchased with the filter, the filter will be set up to match the media. If no media is ordered, tell us your intended use for the filter and we will furnish it with an appropriate flow control device. There is no pre-shipment setup of control valves with the these filters, but we can suggest and help with setup after the purchase. 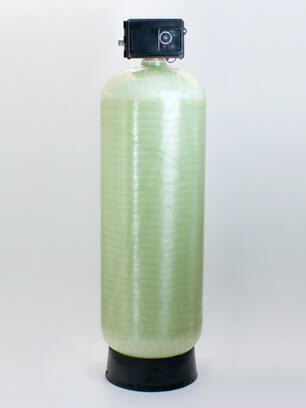 Filter Media, Price Per Cubic Foot. Multi-Media (garnet, sand, anthracite) : Call for pricing. For size comparison, a 21″ X 62″ filter (10 cubic feet of media) beside a 10″ X 54″ filter (1.5 cubic feet of media).